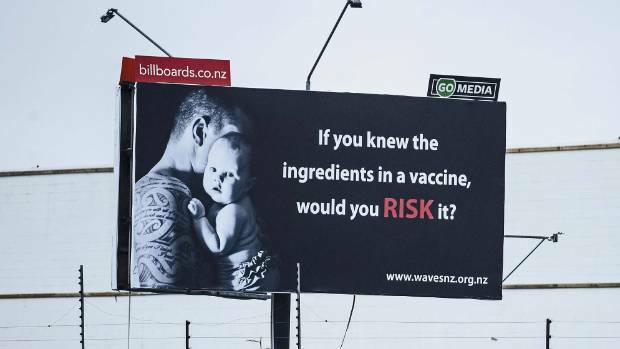 That image is a visual counter to a now-removed billboard put up on an Auckland motorway by the NZ group WAVES (Warnings Against Vaccine Expectations). Since aluminium is the most abundant metallic element in the earth’s crust, it’s found naturally in water, air, and in some foods. In other words, we’ve evolved with it in our environment. Even human breast milk contains it, at around 14-34micrograms/litre. And in vaccines? The Boostrix vaccine (DTaP) contains 0.5mg Al per 0.5mL dose. The amount in Gardasil 9 is the same. In comparison, the USDA estimates intakes from food & drink of 0.10mg/kg/day for 6-11 month infants, 0.30-0.35mg/kg/day for 2-6 year-olds, 0.11mg/kg/day for 10-year-olds, & so on. The vaccines don’t work out at “several times the safe limit”. The post antivaxxers’ dangerous misinformation appeared first on BioBlog. Waves posts were all debunked quickly, once several pro-vaccine\science groups found out about the Billboard and their posts. Of course, these pro-science comments were all deleted, which is ironic as at the same time Waves were complaining about freedom of speech as their billboard was being taken down. Yes, I’d noticed that. Totally hypocritical of them. None of the “anti” sites have much tolerance of opposing views: anti-fluoride, anti-vax, anti-1080 all delete & block or ban. Thank you for your clarifications around the science, always refreshing. BTW, can anyone explain how this ‘wavesnz’ group managed to achieve charitable status? It beggars belief frankly. A lot of misinformation on aluminum here. It’s true that there is a lot of aluminum in food but what they fail to mention is that gastrointestinal absorption is extremely low when aluminum is ingested <0.3%. We can see that a baby will absorb just 23 micrograms of aluminum ingesting breast milk but 4400 micrograms from vaccines. The published scientific literature shows that aluminum adjuvant can be neurotoxic if weight adjusted doses are injected into animals. 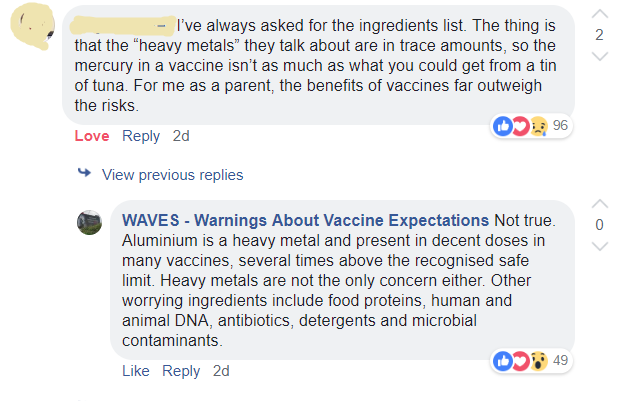 It's irresponsible to claim that only insignificant amounts of aluminum are found in vaccines when this is clearly not the case. So you’re suggesting that the entire 4400mcg of Al from vaccines given across 6 months is absorbed? Since it doesn’t enter the bloodstream in one hit, and since Al is also excreted reasonably rapidly, then I think you need to provide evidence that sufficient is absorbed to cause harm. An actual link to the source(s), please, not simply a word/phrase.